NEW Grotenhuis Music Collection Released! Are you a Reformed church musician who struggles to find musical resources related to the blue Psalter Hymnal? For the 1912 Psalter, there are accompaniment tracks, choral arrangements, and even entire conferences produced by members of the Protestant Reformed Churches. And an entire section of the publishing house of the Reformed Presbyterian Church, Crown and Covenant, is devoted to selling their own psalm-singing resources. But for us in the URCNA, besides the occasional MIDI track that reaches our computers through the internet grapevine, there isn’t much beyond the bare sheet music of the blue Psalter Hymnal. Except for the work of the late Dale Grotenhuis. Painfully aware on my own part of this great need for Psalter Hymnal resources, I discovered some of Grotenhuis’ choral settings fairly soon after beginning URC Psalmody. As I listened to his versatile and varied arrangements on Dordt College’s 6-CD set Be Thou Exalted, LORD, I fervently wished I could somehow get my hands on the sheet music. Since most of Grotenhuis’ music was never formally published, however, it seemed a fruitless task. The Grotenhuis Music Collection was deeded to Dordt College by the Grotenhuis Estate in 2013. The physical collection includes over 500 unpublished music scores composed or arranged by Dale over the course of his career and is housed in the Dordt College Archives. Choral and instrumental pieces make up the majority of the collection with the instrumental category being further subdivided into band, brass, and keyboard compositions and arrangements. Most of the scores are undated. The few dates specified range from 1973 to 2002. All scores were scanned in their original state to preserve the primary format of the works. The Estate assigns a Creative Commons Attribution/Noncommercial/No Derivatives (CCC BY-NC-ND) license to all of the material in the Grotenhuis Music Collection. Individuals who wish to publish materials from the Grotenhuis Music Collection must secure permission from both the Estate and from Dordt College in its capacity as the owner of the physical property. A set of descants for congregation and organ/trumpet accompaniment for selected tunes from the blue Psalter Hymnal. A set of organ arrangements of tunes from the 1912 Psalter and the blue and gray Psalter Hymnals. Whether you’re a pastor, an accompanist, or just a musically-minded member of a Reformed congregation, this collection of Grotenhuis’ works just might become your new standard resource for sheet music related to the blue Psalter Hymnal. I’m thinking especially of small churches which, in the absence of pianists or organists, often need congregational accompaniment from whatever instrumentalists happen to be on hand. With access to a library like this, finding a trumpet transposition or clarinet arrangement of a Psalter Hymnal tune becomes a manageable, maybe even easy, task. Reformed musicians owe the Grotenhuis family a huge thank-you for making such a valuable resource available to the church at large. As more and more people become acquainted with Dale Grotenhuis’ collection, I’d love to see the development of a topical index or search function to make locating a particular piece or instrumental part more efficient. For now, though, this incredible library of music for Reformed churches is all there, ready to continue its service for God’s kingdom—just as its composer had always intended. Although most of our Featured Recordings here on URC Psalmody have focused on particular mechanics or nuances of church music, today’s video is simply for your listening pleasure. But along with it comes an opportunity for some reflection as well. Here in the United Reformed Churches in North America, many of our congregations are small, some are constrained to worship in subprime acoustical areas, and a growing number are composed of first-generation churchgoers who are still learning how to use their voices in praise to God. Especially for these young churches and church plants, the problems associated with establishing good congregational singing are numerous. Organ or piano accompaniment (or guitar)? Blue Psalter Hymnal, Book of Psalms for Worship, or some other collection of psalms and hymns? What about “contemporary music”? I don’t believe there is a universal answer to any of these particular questions. 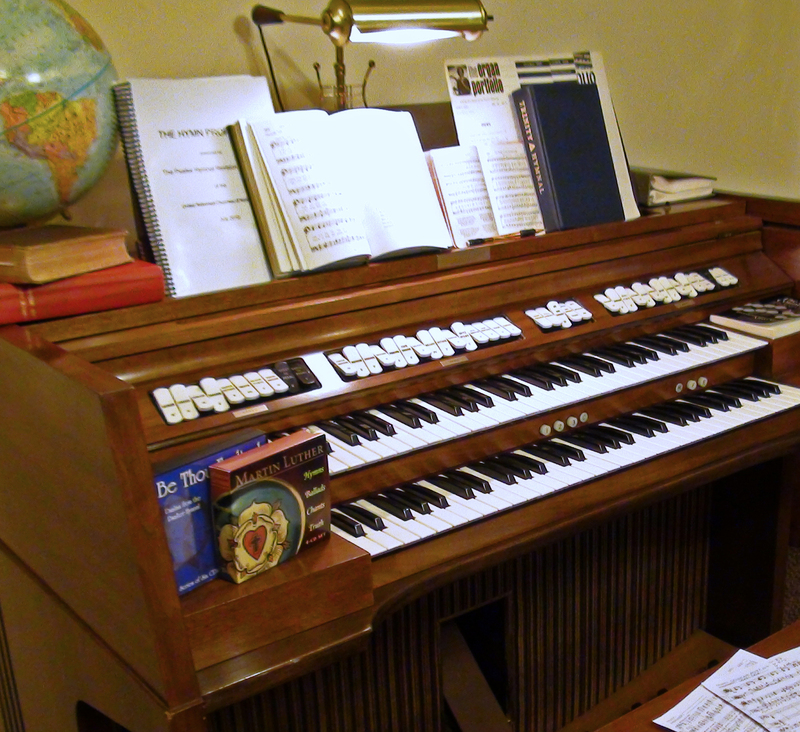 Perhaps organ accompaniment, while useful for a large congregation, will prove overpowering and ugly in a small urban sanctuary with a whiny old electronic instrument. Depending on a church’s background, the songbook of choice may vary as well. It may even be necessary to use some form of “contemporary music” in a newly reforming congregation for a time. Despite these widely varying circumstances, however, I believe there is a universal and attainable ideal for good Reformed church music. Its primary instrument is a congregation of any size that knows how to sing, why to sing, and what to sing. Its primary material is composed of the psalms and Scriptural songs, whether or not uninspired hymns are included. Its accompaniment (whether piano, organ, guitar, or some other instrument) serves only to support the singing of the congregation, not to dominate it. In short, it satisfies all of the requirements of Biblical, sincere, and beautiful worship. This complex preamble brings us to today’s Featured Recording, which I believe is an excellent example of good church music. The congregation which provided the recording is one of our own sister churches, in fact: Grace Reformed Church in Dunnville, Ontario. As a fairly large church with a strong Dutch Reformed base, they use primarily organ for accompaniment and sing out of the blue Psalter Hymnal, like most of our federation. And they excel at it! This particular selection, “Hallelujah, Praise Jehovah” (Psalm 146, Psalter Hymnal #301), is sung with gusto and skillfully accompanied by Scott Lindeboom. The tempo is not so slow that it drags, but allows ample time to think about the words as they’re sung, while the broadly exultant affect of the psalm is perfectly reflected in the music. Are there any particular strengths or weaknesses you’d like to point out in this recording? How would you suggest applying these criteria for good church music to other worship settings? As always, the comment section is open!